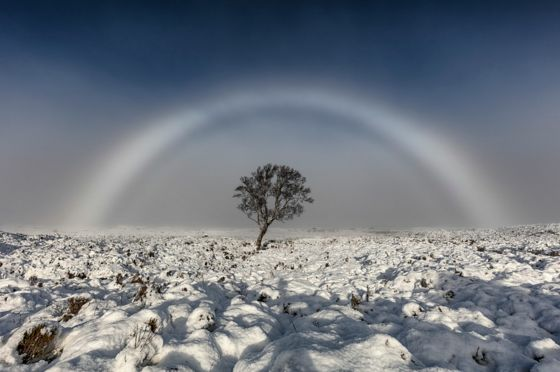 A stunning shot of a white "fog bow" has been captured by a photographer over Rannoch Moor in the west of Scotland. Melvin Nicholson was out on the moor, south of Glen Coe, on Sunday when the "unbelievably beautiful" white rainbow appeared. Mr Nicholson said: "It is a colourless rainbow that is made up of tiny water droplets that cause fog. "It's an amazing thing to witness and can generally only be seen if the sun is behind you when you are looking at it." Climber Andy Luke took his image on Sunday near the summit of Cairn Lochan. He said: "It was quite amazing."